Once viewed as a futuristic aspiration, the smart city concept is now firmly on the operational agenda of government officials and private sector solution providers. The evolution towards grounded solutions means that adopters and solution providers require tangible strategies along with workable frameworks and planning tools to initiate their smart city initiatives. For evidence, look at how the emerging smart city industry acts as a host to multiple smart city reference architecture initiatives in parallel with multiple check-list criteria that aim to rank cities on smart city implementation roadmaps. In the spirit of practical solutions, let’s focus on two structural features about city planning and management to illustrate the real-world challenges that city authorities will have to overcome. The first deals with differing economic profiles that characterize individual cities. The second concerns existing commercial models that cities and their private sector service providers will have to adapt to foster viable and enduring smart strategies. In many cases, early-mover smart cities tend to be economic powerhouses. They benefit from a sizeable local tax base and relatively easy access to technology experts who know how to create, launch and operationally support smart city services. The City of London, for example, made its transport sector data freely available to developers who created applications and services to improve journey planning. Empirically, this seems to have resulted in new job formation and the more effective use of commuter time and transport sector assets. Los Angeles, with a population of roughly 14m, experimented with several smart city initiatives with support from Google . Most cities, however, are not comparable to a London or a Los Angeles. In terms of size as defined by population metrics, for example, roughly 10 out of almost 20,000 cities in the USA can claim more than 1 million inhabitants  which presents a major issue regarding scale. This issue came up in a UK Government study on the future of cities  which discussed two spatial definitions for smart cities. One considered ‘cities’ as labor markets, based on a geographic footprint defined by travel to work areas (TTWAs). The second method defined the term public urban area (PUA), representing major towns and cities based on their geographical built-up area within contiguous local authority districts. A corresponding spatial measure for the USA is the Metropolitan Statistical Area (MSA). MSAs define distinct geographic regions with a relatively high population density at its core and close economic ties throughout the area. Even using this metric, the distribution of 366 MSAs exhibits a long-tail of small to medium sized areas with almost 90% coming under (the arbitrary) threshold of 1m inhabitants . 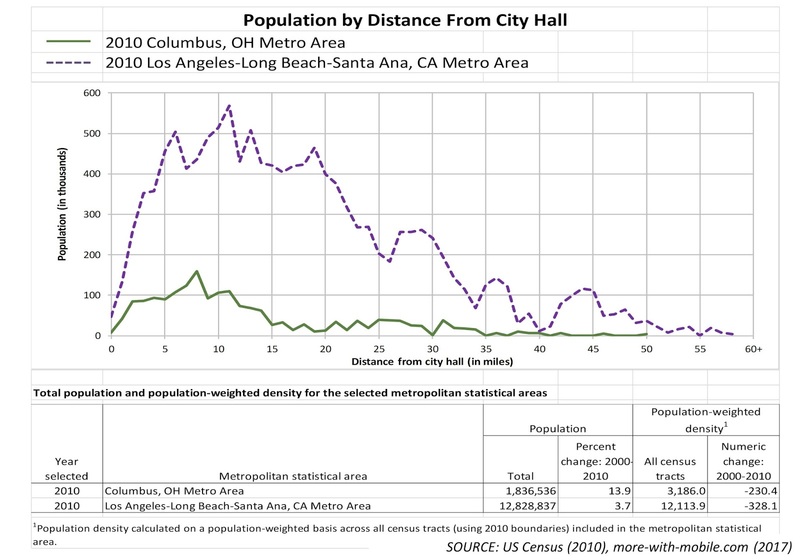 A comparison of two areas, Columbus (OH) and Los Angeles (CA), with populations above the 1m threshold illustrates different population concentration and geographic reach characteristics that planners have to deal with. 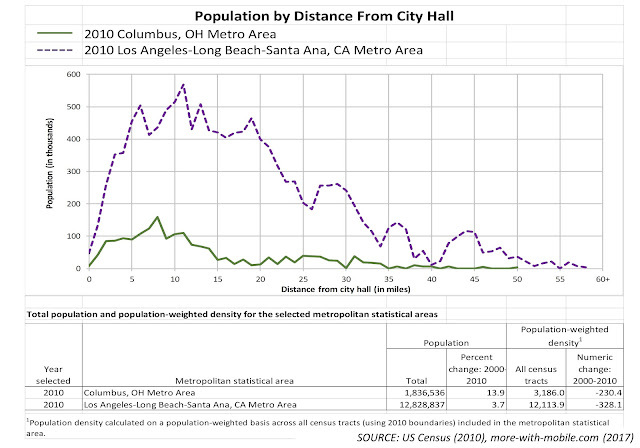 Los Angeles has a large population with a heavy concentration in a 5 to 25-mile radius from City Hall, whereas Columbus (OH) is considerably smaller and spatially more concentrated, although both MSAs cover a similar radial span of 50 to 60-miles. The fact that a smart city service might be financially viable over a narrow tract of land (exhibiting concentrated economic activity due to high population density) or a short transport corridor does not automatically mean that it will be deployed across an MSA, for example, or be viably in a lower populous MSA. In the case of Columbus (OH) and smaller MSAs, for example, what implementation strategies and financing models will be needed to serve the population living 15 or so miles away from City Hall? Smart city assets, or should that be 'liabilities'? Many cities rely on private sector providers to deliver a whole raft of citizen services. Healthcare departments may rely on third parties for social care or for patient transportation services to care centers, for example. Transportation departments license private sector taxi fleets. They may rely on third parties to manage city-owned parking and street-lighting facilities as well as traffic management systems (CCTV monitoring, speed sensors etc.). These arrangements are supported by commercial contracts from the pre-IoT era. In other words, they were not designed with data or IoT-like applications in mind. One city, for example, might obtain car park occupancy data for a 24-hour window, and possibly at the end of the month for accounting purposes. If it wishes to obtain hourly (or more granular) occupancy data from its service provider (touchpoint #1), it would incur additional fees to agree a new service agreement and to cover the technology and system integration costs of managing one or more data feeds. From an IoT perspective, the desire to manage traffic and congestion via a smart parking service turns the city’s car park assets into a liability. In the broader spectrum of issues, cities have much to gain from inter-departmental collaboration (touchpoint #2). Setting up IoT-capable data sharing interfaces, where data is accessible to users and application developers without the friction that some IT departments introduce, also generates cost and technology liabilities. Moreover, this is not just a matter of connecting departmental IT applications. It applies to data that may reside in proprietary databases, geographical information systems (GIS) and even Excel spreadsheets. The integration touch points illustrated above relate to brownfield scenarios i.e. adapting an existing system and set of city assets to be IoT capable. A third complication for cities relates to greenfield systems. Many smart city applications will emerge from the combination of existing (brownfield) assets and new (greenfield) sensor deployments (touchpoint #3). How these are integrated in technical, organisational and investment terms will determine the pace at which the smart city phenomenon delivers on its early promise. 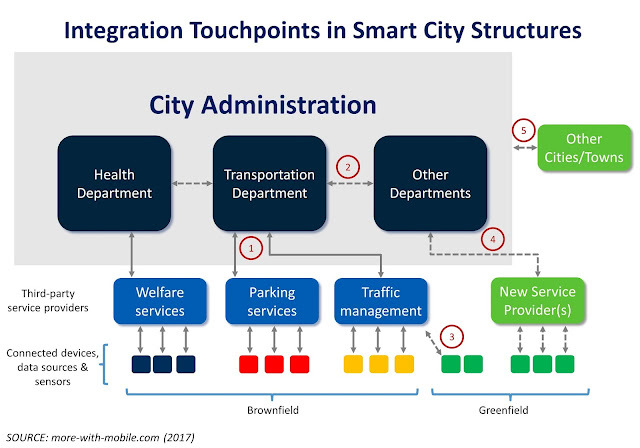 There will be other greenfield issues as new services providers (touchpoint #4) are added to the smart city eco-system. And, at some stage, cities will interact with other cities and towns (touchpoint #5), creating another integration touch point for data and common apps. How should cities approach the long-term challenge? and, the use of horizontal strategies to encourage interoperability (within a city’s administrative departments, with other cities and with third party partners) and extensibility (minimizing the marginal cost of supporting new applications while leveraging economies of scope through cross-application innovation). Vodafone UK is promoting some useful research and data points on 'Digital Super Towns'.